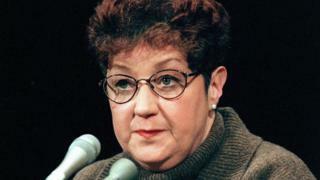 Norma McCorvey, whose test case made abortions legal in the United States, has died aged 69. She was represented under a pseudonym in the Roe v Wade case, in what ended up being a landmark and controversial Supreme Court judgement in 1973. Having turned to religion, McCorvey then said being part of the decision to legalise abortion "was the biggest mistake of my life". She also unsuccessfully petitioned the Supreme Court to overturn Roe v Wade. Her death, in a Texas care home, was confirmed to US media by a journalist who had been working on a book on the case. The ruling in January 1973 came after McCorvey, then a 25-year-old single woman under the pseudonym "Jane Roe", challenged the criminal abortion laws in Texas that ruled abortion was unconstitutional, except in cases where the mother's life was in danger. Henry Wade was the Texas attorney general who defended the anti-abortion law. McCorvey first filed the case in 1969 - she was pregnant with her third child and said she had been raped. But the case was rejected and she gave birth. However, in 1973 her appeal made it to the US Supreme Court where, by a vote of seven to two, the justices ruled that the government lacked the power to prohibit abortions. The court's judgement was based on the decision that a woman's right to terminate her pregnancy came under the freedom of personal choice in family matters, as protected by the Constitution. McCorvey, having revealed her real name in the 1980s, went on to clarify that she had not been raped as she had earlier claimed. She had said so only to get permission for an abortion and speed up her case. By the time the legal challenges to her case were over, her daughter was two and had been given away for adoption. "I'm a simple woman with a ninth-grade education who wants women not to be harassed or condemned," she told the New York Times in 1994, before she went on to denounce abortion. "It's no glamorous thing to go through an abortion. I never had one, but I've worked in three clinics and I know." In an anti-abortion television advert broadcast earlier this decade, she said: "Abortion has eliminated 50 million innocent babies in the US alone since 1973. Abortion scars an untold number of post-abortive mothers, fathers, and families too." Before Roe v Wade, some states had already started to reform or repeal laws on abortion, but women seeking a termination had to do so illegally, at great expense, and often in unsafe conditions. One underground network run by women in Chicago said it performed some 12,000 abortions in the late 1960s and early 70s, before the court ruling was made. In more recent years, the issue has proven to be among the most divisive in US politics. Last month, President Trump signed an executive order banning federal money going to international groups which perform or provide information on abortions. The order, known as the Mexico City Policy, was originally put in place by Ronald Reagan but was rescinded under Bill Clinton. Although the policy does not directly affect services in the US, Mr Trump has said he supports an abortion ban at home, where several states maintain restrictions on abortion services. In many parts of America, women have to travel for hours to get an abortion because access to services is limited.